If you’ve ever thought of participating in or running your own online summit or training, you may be wondering how it all gets put together and maybe some best practices. I’ve run 3 so far and I got to tell you, I really love them for easy attention for myself and my clients. I believe in the power of video and connecting to an audience by offering big value before asking for an investment. I love the idea of pulling from many audiences because it’s free cross-marketing. I want to collaborate with people who love what they do (especially if it’s a little woo-woo). I have clients who needed a visual boost and were featured on the summit. So the extra time I put in was an investment in them. It gives me a chance to show off my skills to those additional speakers that may need my services. BONUS: I get to have amazing conversations with healers and teachers I admire. There’s nothing like getting an hour with an expert you always wanted to have all to yourself (and an audience). 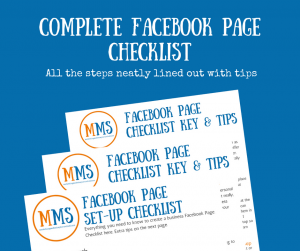 The fantastic thing is I hit all these goals, even if I missed a couple more detailed stat-related ones like how many sign-ups I wanted for one of my clients freebie gifts or didn’t quite get as many shares on a specific post. Overall, I would give myself a B overall, and maybe even an A considering the time frame I gave myself to pull it off. So in all transparency, like the friend I am, I thought I would share what I knew, what I did and what the results are. 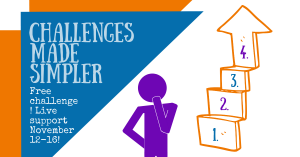 People need practical exercises to follow – especially in personal growth. So I ensured that each speaker was going to be able to offer things they could actually do, not just talk about theories and ideas. We want some meat in our summits or else it is endless dribble no one will tune in for. I had to find the balance of content between too little to be of interest and too much that overwhelms, while considering that not everyone is going to be interested in every topic. It’s a lot to think about. Also didn’t want to leave any gaping holes in what the speakers talk about. So I had to ensure all areas of what I thought was important to inner wisdom was covered. I knew I would need to provide as much as possible marketing-wise to make it easy for speakers to promote it among their peeps. This meant creating images, sample copy, their own landing page so they could keep all the names they culled by getting people to register. This was a free effort, so I treated it as such. I intended to put no money in and kept that – so no paid marketing or marketing help. After all, my time is valuable and I was giving a lot of it. I created a Google Form with all the information I would need about a speaker to contact them and information to know whether they might be a good fit for my vision. I invited speakers, mentors and influencers I know to fill out the form. I wrote an acceptance letter with information like a general outline of when they should receive more information and the marketing timeline. I included the additional info I would need (headshot, bio, session outline if it wasn’t provided in the Google Form). I also included their Zoom link for the date and time they completed in the Doodle form. Once or twice a day I would check the form, set up the Zoom (and add it to my calendar 6. I also started the marketing pieces when I had time. So I got in the general thoughts around colors and images. I redesigned a website I already have for this summit. I added a general info page, a sessions page and a speakers page. I created a landing page with all the sessions and speakers and information. I duplicated each of those pages so each speaker had their own – big freaking shout out to Mailerlite because I did it all for free through them. I created a welcome email so everyone knew what was coming up and gave them some freebies right off the bat so they remembered us when May 23rd came around. I created graphics of different colors and sizes for social media. I also created headers and each presenter had access to their own image in a summit branded frame for their profile pictures on social media. I wrote 3 emails and 3 posts they could use for marketing or they could create their own. I created a page for the speakers that gave them their links, all the instructions they needed for marketing, the images and the copy. This page also had their session release dates since these were all prerecorded. Started marketing on the Monday of this week through free social media, my past lists which weren’t very big because again – this wasn’t my audience. Posted on all my social media channels. Recorded about 12 sessions this week. Helped speakers with their freebies and sign-ups. Sent reminders about marketing to speakers. Wanted to boost registrations so we decided to offer prizes to raffle for the comments in the first 24 hours of the release of each of the sessions. Got all that information organized. Advertised the prizes we added the week before. Recorded the additional 10 sessions (if you’ve been counting and adding, 2 people did solo videos). Edited the things that were essential to edit (my computer is not meant for video editing). Added a back and front cover to the videos. Uploaded the videos for the site. Realized the audio for one was really awful so I scheduled to re-record. Started putting together the landing pages for each session. Completed a page for each session. Created a page for each day wrapping up the sessions. Created an email for each day to send to audience. Sent the pages of sessions to the presenters so they could find theirs and answer questions. Did a daily Facebook Live video to draw all the winners of the prizes. Put together a Survey for the audience members to complete after the summit. Put together a survey for the speakers to complete after the summit. A wrap up email to the audience. A wrap up email to the speakers with each of their stats and their list of people from their form. Statistics and analysis of whether I hit the goals (specific and general) that I had. Phew – no wonder I was so tired – after all this was just a side project. 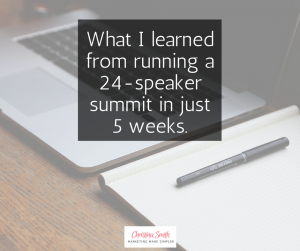 This was on top of creating a website for a speaker, and many other marketing tasks for the speakers to help them get the most of the summit. Conversion rates were pretty good and ranged from 10% to 68% and considering each landing page was the same content, it said a lot about the audiences and whose were right for the summit and whose weren’t. My clients added free people to their email lists by both their specific registration link and also be offering a freebie during their session. It was an easy win for most of my clients who were somewhat new to online marketing. Speakers shared and gathered over 600 registrations (and counting as the summit is free forever). This again was without guerrilla marketing – most only posted a couple times – some didn’t even have a following to market to. There were dozens of comments and lots of connection through the speaker pages and the Facebook group that was offered for participants to connect to speakers and see the daily winners. Speakers have already sold their services to people from the summit – so it was profitable for many! Both the speakers and the audience seemed to really love it. More market research. For this specific conference it was general because I was trying to hit a lot of bases. Normally I would say to find a niche. It would make greater impact and speak more to the right individual. Make it easy as possible, and then even easier for speakers to share your content. I thought I did this well, but I bet it can be tweaked. More pre-planned marketing with a clearer schedule (which I would normally do if I gave myself more than 5 weeks. Pin down topics and specific points a little more ahead of time to ensure everyone has an outline and we don’t go off track. Get someone else to host the sessions. I love the conversation and I don’t feel this is my spot to fill. My ideal situation would be to run these for someone else’s launch and have them do the interviews as the expert. Create a financial gain for these in order to be able to invest in advertising. That’s where the best bet is with fishing for cold leads. I probably learned a lot more and I’m sure I missed some things I did as I didn’t mention all the places I marketed it, but y ou get the general idea. So if you are thinking that a summit might be fun or create a buzz, you can try running one to, or get my help. I really like these big projects. I love them when I have more time for creativity and connection. So please give yourself time and commit to working on it each week so you don’t get summit-burnout. If you want to chat about how to plan yours or get a question answered, contact me. 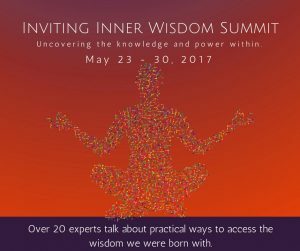 Oh – and you can still sign up for the summit to check it out here: Inviting Inner Wisdom Summit. ← Want your tribe to follow a funnel? Always tell them what to do next.